My son, Max, has been suffering from horrible migraines since about last November. At first we thought he was simply ill with some bug. First it was strep and then mono. He was given antibiotics and given time to recover. After about a month, we went to Urgent Care and they diagnosed him with migraines and stated the nausea was due to the headaches and referred us to Infectious Disease (because of enlarged lymph nodes) and neurology. 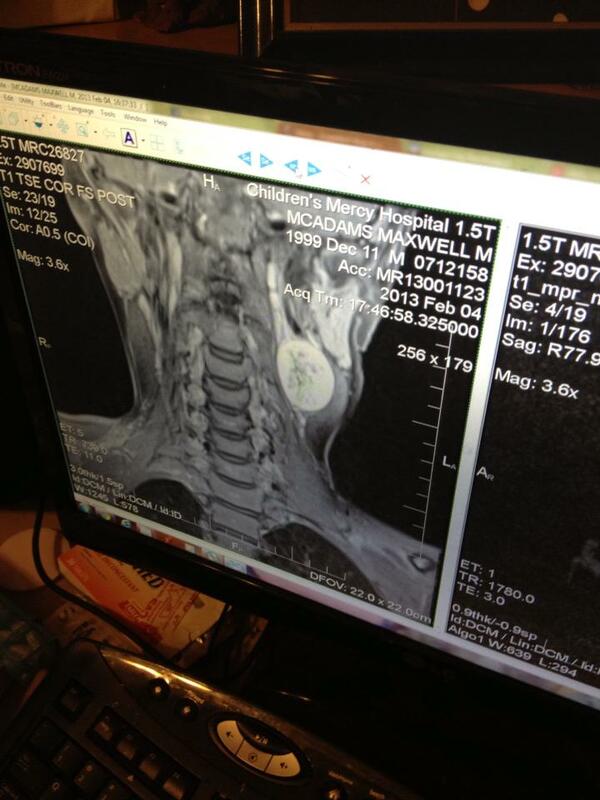 After about another month with no improvement we were sent to the Ear Nose and Throat specialist who had an MRI done. 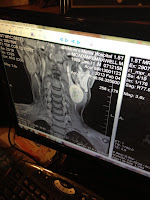 The MRI revealed a large tumor right under his left jaw and we were referred to other doctors and the decision to take the tumor out was made. I don't think I really expressed to people how scared I was. I was scared as heck. The tumor was intertwined with a bunch of nerves right near his carotid artery. 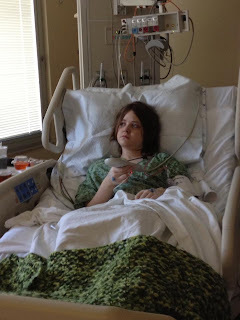 We had to have the surgery scheduled at the University of Kansas Medical Center instead of Children's Mercy Hospital so that a vascular surgeon could be on stand-by. I had the worst case scenario's constantly in my head. The only reason I was not in the fetal position and crying was because of the facade I put on for Max and Abby so that they would not be afraid. So, I did the only thing I could do. I asked people for prayers. I asked priest friends for prayers. I let the parish know. I posted updates on Facebook which seemed to bring in comforting prayers. The St. Brigid Needlework Group at Holy Family even made Max a prayer shawl. I expect there were hundred's of people praying for Max. People who have never met Max and probably never will. Finally, the day of the surgery came. I was a nervous wreck wondering what the day would bring. We got Max checked in and went to the surgical section of the hospital. Max changed out of his clothes and into a hospital gown. We met with nurses and doctors---who were all very wonderful people. The anesthesiologist was wearing a cross necklace---which as silly as it sounds---was comforting. We were told that the surgery was scheduled for four hours but that it could be five or six hours before he was actually out. They started giving Max an IV and I was hoping they had a sedative for me. We were taken out to the waiting room and given numbers. 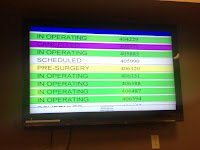 One number was so that we could keep track on a monitor where Max was---pre-op, in surgery, post op. 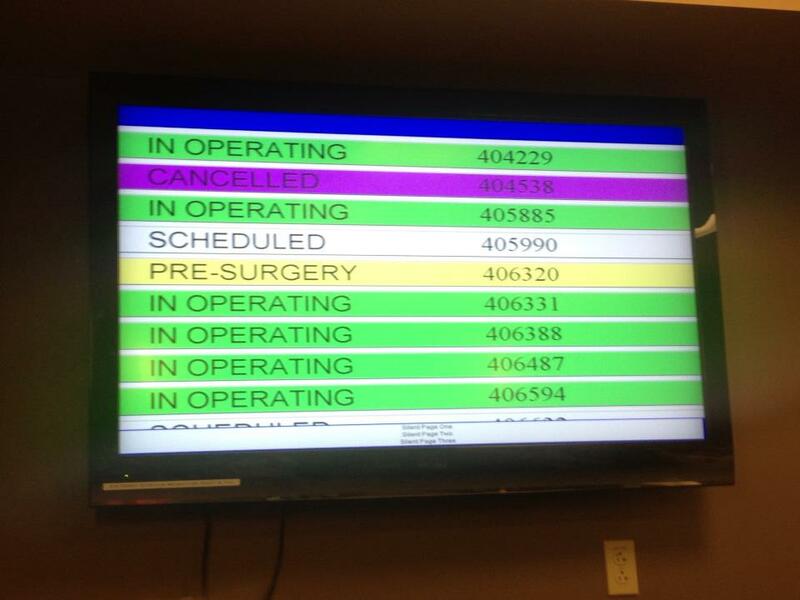 Another number was on a sticker so that nurses could come out and give us updates. We were told that Max's doctor would probably come out every couple hours to updates us also. So we sat down for the long haul. I had food and drink so that I would wouldn't have to leave. I had my cell phone with charger. I even brought the big-guns---my lap top. I could have been there for days only having to leave for the bathroom. We watched the monitor like a hawk. Waiting for Max's number--406388--to come around. Finally, it changed and said "In Operating." This was going to be a long day. It was nerve racking. Occasionally nurses would come out, calling numbers and giving families updates. I remember one young lady left crying with the nurse grabbing her belongings. At about 9:30--a couple of hours into the surgery, Dr. Francis (don't think she is any relation to Pope Francis) came into the room and had us step out into the hallway. I was expecting her to tell me and update about how the surgery was going. In fact, they were done. It only took two hours. The tumor was connected to a nerve in two places and came out very easily. The surgery could not have gone any better. The first thing I could think of was that prayers work. The second was, "Oh crap, I left my wallet on the table in the waiting room. I need to go get it!" AFTER I got my wallet, all I could think about was how many people had been praying for Max and not only had everything got well, not only was my boy okay, but surgery was quick and easy. It did not take 4-6 hours. Heck, I had barely started my Three Stooges movie! Pathology later revealed that the tumor was a neural sheath schwannoma---which is benign and non-cancerous. Max is recovering well a week later. It'll be seen if the tumor was the cause of his migraines but I think we have medication that has been keeping them in-line. Prayers work. I didn't have any doubt that they worked before the surgery. That wasn't the root of my fear. My fear was that God's will was different than my own. I am so thankful for God and for all the people praying for Max. But now, I believe God has given me more time with my boy to help form him into a saint----which will take more prayers so keep them coming please! !